I was hiding away in my bedroom, trying to recharge after a crazy week. I had a good book and a bag of Smartfood popcorn all to myself. I was in Heaven! A few minutes later, there was a little knock on the door. My five-year-old daughter Jocelyn came in. I wasn’t surprised. My kids have a sixth sense and x-ray vision when it comes to junk food: they can see it through walls and ceilings. “You came for my popcorn, didn’t you?” I asked Jocelyn. Very matter-of-factly, she answered, “No. I just want to be with you.” Then she climbed up next to me and put her head on my leg. I started stroking her hair. She drifted off to sleep. 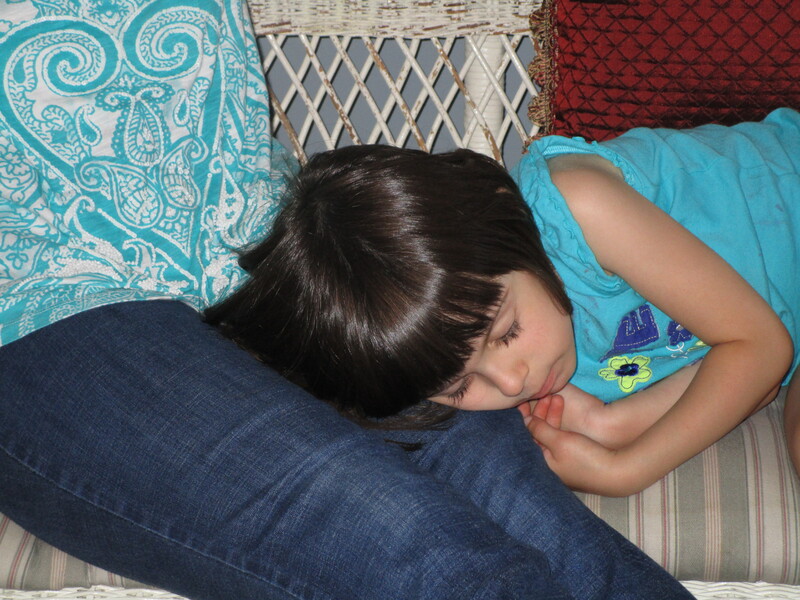 We stayed like that for at least half an hour: her just sleeping on my lap, me stroking her hair as I read. It was so peaceful. That half hour was so tender and pure, it felt like a prayer. I think God must feel exactly the same way when we go to Him and just rest in Him. Of course He’s there to listen to us as we hash through our problems, plead for His help, and then thank Him for His intervention. But at the core of it all, I think God just wants us to want to be with Him. They say that having the desire to seek God is half the battle. I do “just want to be with Him.” And I have had a few golden moments over the years when I have been successful just “being” in His presence. It was powerful. It was life changing. I want that as often as possible. I think that through practice and discipline, I just might get there again.